Hello March! You came by too quickly but we are very happy to see you! March is birthday month (yay?) but also Blogiversary month! It’s been 5 years since the creation of Food Mamma. We will be celebrating all month long with giveaways from some awesome folks – more on that to come! When I saw the post about brownies with only 2 ingredients, I was intrigued. When I learned that one of the ingredients was Nutella, well, I just had to try it for myself. The recipe called for 4 eggs, I had 3 and I still needed to make breakfast. I used one egg for french toast and the other 2 to make a small batch of these brownies. With two ingredients, the batter came together quite quickly. The waiting for the brownies to be baked and cooled, well, that seemed like it took forever. Q came into the kitchen every five minutes, is it done yet? To make it look pretty, I did add powdered sugar, but you don’t have to. The brownies were dense and fudgy and oh so good. I kind of wish they weren’t so easy – it’s a dangerous recipe to have! 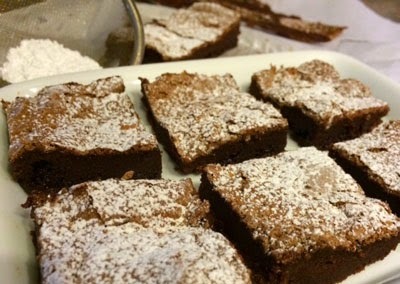 Line an 8×8 brownie pan with parchment paper; set aside. Place the eggs in your mixer’s bowl and beat for 5 to 7 minutes, or until the eggs have tripled in size. Heat the Nutella in the microwave for 60 seconds. Remove and stir. Easy to make yummy brownies. Thanks for sharing the recipe.